It is our pleasure to have David Bird's first ground up build on our cover. We recap some Big Mountain Run 9 (it really wasn't that good), Dan tells us about the Keystone Collective and Ken was live with Travis Pastrana during his world record jumps. We took a first ride on the Indian. 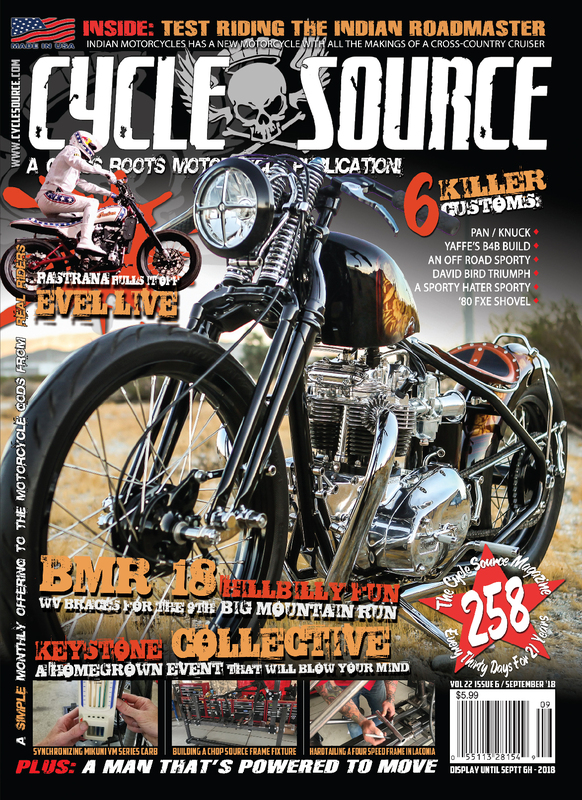 We jam-packed it with 6 killer bike features, product spotlights and some great stories of the life we choose to live. Pages are filled with tech articles from some of the best in the business including how to synchronize Mikuni VM Series Carbs with Pandemonium, building a Chop Source Frame Fixture with Flat Broke Chops & Rods and hardtailing a 4 Speed frame.